I’ve had my eye on these miniature tomatillo looking things for a few weeks at the Farmers Market. I didn’t know what they were, but my curiosity was peaked so I asked a stall owner and she offered me one. I was hooked at first bite. Ground cherries have a fruity flavour like a mild combo of pineapple, strawberry and tomato. Surprisingly, though, they are not a cherry, nor even a fruit. I searched around online to see how others used them (there are some recipe links and ideas below) and based on the recipes I found, these little puppies seem to be capable of doing double duty as both fruit and vegetable. I’ve seen them used in raw veggie salads and salsas, in jams, preserves and pies. I decided to make mine into a pie, but not a regular pie, a mini pie. 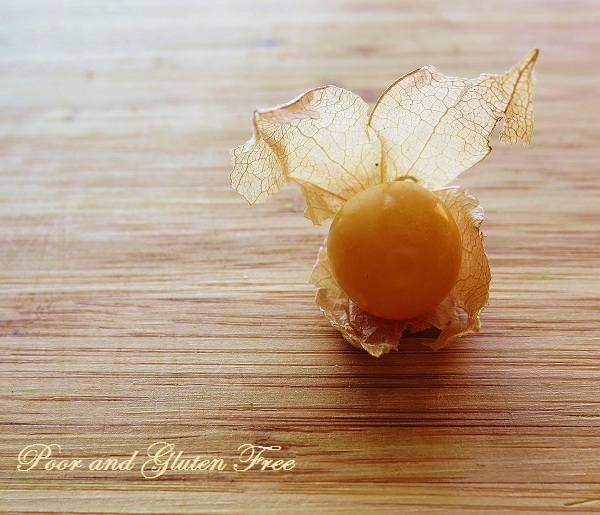 So What are Ground Cherries? Ground cherries are small yellowy, orangey balls in a papery husk, in season late summer and early fall - so snap some up now while you can! Despite the common name “ground cherry”, which is due to the fact that they fall to the ground when they are ripe, they are actually from the Solanceae family, which includes tomato, potato and eggplant. For you folks with Oral Allergy Syndrome, or allergies to tomato, potato and eggplant, that means there is a chance of reaction. I tried one at the market raw (with trepidation, like I do with anything new and potentially allergy inducing! ), waited 30 seconds and everything seemed ok. When I got home I ate a few more raw and decided that it was probably best if I baked them, since I started to get “that feeling” in my mouth and throat – those of you who react to fresh fruit will know what I’m talking about -that slightly itchy, uncomfortable swelling. So anyhoo, with that in mind I decided to skip the raw recipes and make pie (baking denatures the allergen protein and makes it less likely for OAS people to have a reaction). I found this great looking recipe and directions for mini-pies on Vegan Yum-Yum and tweaked them with some gluten free crust, adapted from this pie crust recipe on Celiac.com. I have to confess I’ve never made a pie crust before, never mind a GF one, but I’m pretty darn pleased with this one. It’s much better warm than cold (the crust seems to harden a bit when cooled, but if you reheat it, it softens again). I loved it with coconut oil, but you could use shortening or butter instead. Now as adorable and tasty as the little pies are, I think next time I’ll either make a regular sized pie, or make these as tarts instead. It could be my own inexperience, or I didn’t seal the tops well enough, but the ground cherries bubbled over and made the cupcake papers and pies sticky. Plus it was a bit time consuming, and I’m all about saving time and money. If anyone has successfully made mini-pies I’d love to hear about it! 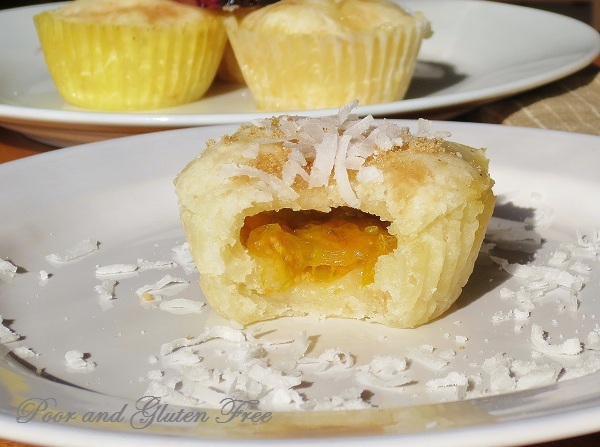 These little pies can be made with any fruit you like if you can’t find ground cherries. I ran out of cherries and popped in some frozen blueberries instead and that was equally fantastic! Also, these freeze really well, and can be reheated in the microwave for about a minute. I should warn you – these little guys grow wild and you might be tempted to run out into the fields and pick some. But please be careful – not all varieties of these are edible, so make sure you know what you're picking or buy from a reputable dealer! 1. To make the dough: In a food processor, add the flour, starch, butter, coconut oil and gum. Pulse to blend. 2. Slowly add the water and continue pulsing until the dough forms a ball. 3. Turn the ball of dough onto a sheet of plastic wrap or wax paper, wrap, and chill for about 30 minutes. 4. To make the crusts: Place 6-7 cupcake wrappers in a muffin tin. Spray lightly with oil. 5. 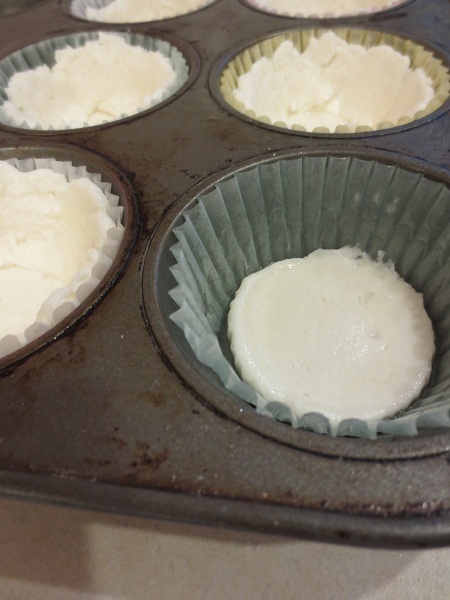 Take about a tablespoon worth of dough, roll into a ball, then flatten it and press it in to the base of the cupcake wrapper. You can use the base of a wet glass to press this in. 6. Using small bits of dough, continue adding dough up the sides of the tin, pressing it into the base and against the sides to make one smooth base, i.e. a mini pie crust. 7. Refrigerate for about 10 minutes to firm the crusts. 8. In the meantime, roll out the remaining dough about ¼” thick between two sheets of wax paper. 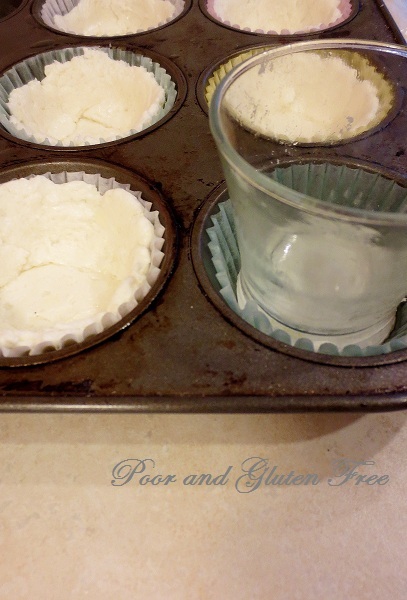 Using a glass with a rim that is close to the diameter of the top of the muffin molds, cut out 6 circles to make the tops of the pies. Keep the whole thing on the wax paper and transfer to a plate or the back of a cookie sheet. Freeze for about 10 minutes to firm up. Alternatively, you could slice strips and lace them over the fruit to make the top of the pies. 9. Mix the ground cherries or other fruit with the sugar and flour. Divide up between the pies and cover with the dough circles. (At this point I used the remaining dough to make a final pie). With a sharp knife, slash an X shape into the tops to allow the steam to escape. 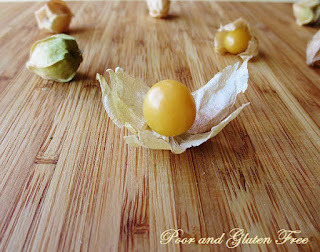 So what else can you do with ground cherries? You could also make them into jam or jelly! I’d love to hear about it if you’ve used ground cherries before! If you have a recipe for them, please feel free to link up below!! OAS Info: While ground cherries are not on the OAS list, they are related to tomatoes, potatoes and eggplant and may cause an allergic reaction in OAS folks (I felt a little tickle with the raw ones). Once baked, they *should* be ok to eat, but it's always a good idea to check with a doctor before trying something you are allergic to. And a b&w version of one of the above photos can be found on Black and White Wednesdays! These look so yummy! 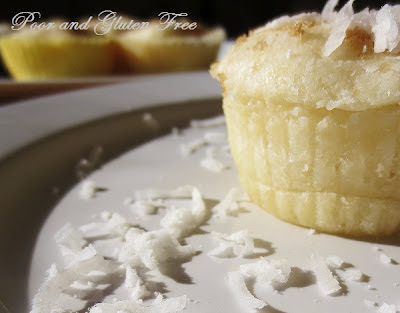 I'd love for you to link this up at my Gluten-Free Monday party at OneCreativeMommy.com and linked up this and any other idea you would like to share. I hope to see you there. I grew pineapple groundcherries this year - I made some into a pie (http://yummysmells.blogspot.ca/2012/09/grape-and-ground-cherry-crumble-pie.html) and the others I put into jam with pineapple (http://yummysmells.blogspot.ca/2012/09/toast-topper-10-pineapple-ground-cherry.html)! I still have some but I just froze them for later, plus there are some on the vines. Sarah, thanks so much for sharing. Your recipes look fantastic, and how cool is it that you grew your own ground cherries! I'm so jealous of anyone with a garden, or even a deck that will fit a pot! 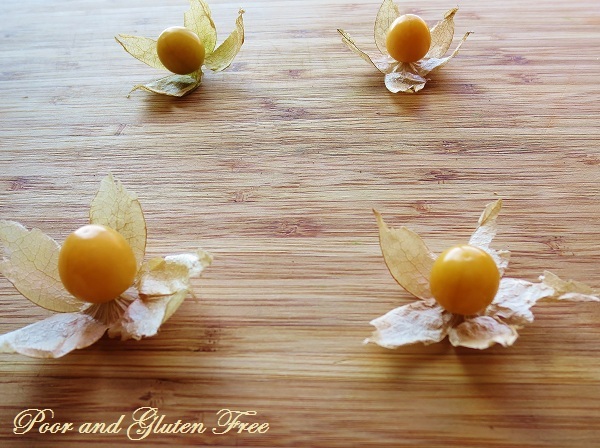 I am going to keep my eye out for these little Ground Cherries, they look so delicate. I love the looks of your recipe and if I can find them I will sure try it. Enjoy your weekend and thank you so much for sharing with Full Plate Thursday. Thanks so much for stopping by, and for hosting Full Plate Thursday Miz Helen :) I'm still seeing these cherries at the farmers market so do keep an eye out for them! I have never seen ground cherries, but my oh my, those muffins look divine! Oh yummy! I love this fruit. Here in Hawai‘i we call them Poha. They make for an excellent jam. They grow a bit like weeds in places.